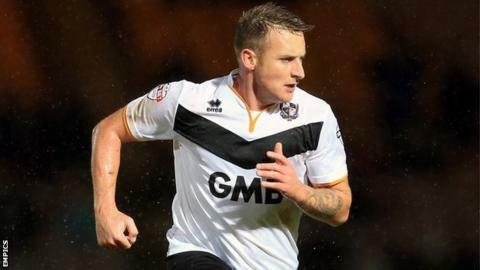 Port Vale midfielder Chris Birchall says he has no regrets about agreeing to stay at the League One club, even though he knows he is unlikely to keep his place in the side. The 31-year-old Trinidad and Tobago international signed a new 12-month deal in the summer and has scored in each of his last two appearances. "I obviously want to play a lot more," Birchall told BBC Radio Stoke. "This is my team, I don't want to go anywhere else and everyone knows that." Vale boss Rob Page defended the club's decision to give some of the senior players new contracts and Birchall says he appreciates his manager's honesty over how best to use him. The defeat was Vale's first in five league games and ended a run of four successive wins. "When you've got the likes of Byron Moore playing well and being more of an attacking threat, I can understand," Birchall said. "Sometimes I've been pulled by Pagey and been told I'm more likely to play in the away games where we have to tactically go in a bit different. "It's been frustrating for me a times and it will be again because Byron will come back into the team but, as long as I'm in the team, I'll do my best and try and get a handful of goals."